"How do you do, everybody, how do you do? 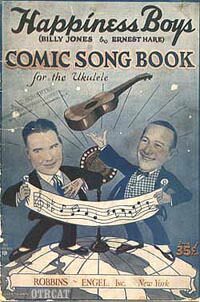 Billy Jones and Ernie Hare created their first radio broadcast together on October 21, 1921. After two years of comedy and musical magic, they became The Happiness Boys in 1923 and did an old time radio show sponsored by the Happiness Candy Company. As such, they became the most popular comedic team of 1920s radio and had the first regularly scheduled comedy show on the air. They changed their names to the Interwoven Pair when their radio show was sponsored by Interwoven Socks in 1929. Two years later, Taystee Yeast became the sponsor, and they changed their names, once again, and alternated between being the Taystee Breadwinners and the Taystee Loafers. In 1939, Ernie Hare fell ill and was replaced by his 15-year-old daughter, Marilyn, who continued the act with Jones for another year. They billed themselves as Heir of Jones and Hare.So tune in for these super rare shows of Billy Jones and Ernie Hare in their various radio programs from the 1930s. You'll hear them singing such tunes as "What's Good for the Goose is Good for the Gander and drumming up laughs that will leave you in stitches! For more rare 1930s radio recordings, see also Rarities of the 1930s. I know there are very few broadcasts extant, but I love the ones you were able to find from theae talented gentlemen. Thanks for including some of the recordings!